Perfect for someone like me too! My own personal favorite in U.S. Civil War fiction is "The Killer Angels" by Michael Shaara. 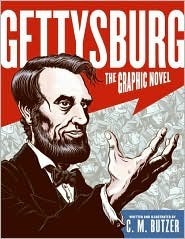 This book was the basis for the movie "Gettysburg" which is fantastic. The prequel and sequel by his son, Jeff, are good, but not as spectacular: "Gods and Generals" and "Last Full Measure." I loved "The Civil War: A Narrative" by Shelby Foote, but you have to be a real die-hard history buff to tackle three volumes and 3,000 pages. Try "Battle Cry of Freedom" by James McPhearson which won the Pulitzer Prize for a one volume history of the war. "Team of Rivals" is one of the best books about Lincoln though there are literally thousands of others. You can check my Goodreads page for my Lincoln reads both read and to-be-read. This is probably more than you wanted to know, but the U.S. Civil War is one of my favorite topics. Enjoy reading.